IDENTIFICATION DATA: in observance of the duty of information provided for in article 10 of Act 34/2002, of 11 July, on Information Society Services and Electronic Commerce, it is hereby reported that the company owning this website is Rodamientos IRB Bilbao S.L., with registered address at Calle Dr. Díaz Emparanza 3, 48002 Bilbao (Spain). Its C.I.F. 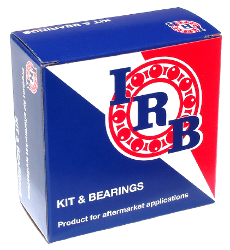 [Tax Number] is B 95783742, and it is recorded in the Company Register of Bizkaia, volume 5501, book 0 in Section 8 on Companies, folio 133, page BI-65328, entry 1, with the e-mail address irb@irb-bearings.com, and phone number +34 944 431 400. All industrial and intellectual property rights over this website, as well as its content, such as, for example, images, software, texts, brands, logos, and design, are protected by law, and any access made to it or use thereof by users should not in any way be considered as the granting of any licence of use or right over whatsoever activity pertaining to or owned by Rodamientos IRB Bilbao S.L.. The texts, images and all other content that may be posted on this website are the sole property of Rodamientos IRB Bilbao S.L. Whatsoever act of public transmission, distribution, conveyance, reproduction, storage or communication, whether in part or in full, on any medium and by any technical means, requires the express prior written permission of Rodamientos IRB Bilbao S.L. All users of this website undertake to uphold the Intellectual and Industrial Property rights held by Rodamientos IRB Bilbao S.L., being entitled to view, print, copy and store the content on their computers or other devices provided they do so exclusively for their own personal and private use, refraining from deleting, altering, manipulating or circumventing any protection or security mechanism that might be installed on this website. The Rodamientos IRB Bilbao S.L. website may feature links and/or hyperlinks to other websites that may be of interest to its users. Rodamientos IRB Bilbao S.L. does not exercise any control whatsoever over those websites or their content, so it cannot accept any responsibility whatsoever for the same, providing no guarantees at all regarding, amongst others and for illustrative purposes only, their technical availability, quality, accuracy, veracity, and compliance with privacy policies, whereby users access the content of said sites according to the terms and conditions governing them and under their own sole responsibility. No hyperlinks may be added to other websites directing users to this website unless Rodamientos IRB Bilbao S.L. provides its authorisation. In the event of there being hyperlinks on other websites to these pages, no assumptions are to be made regarding the existence of any relations between Rodamientos IRB Bilbao S.L. and the owner of the website on which they are posted, nor of any acceptance or approval of their content or services by Rodamientos IRB Bilbao S.L..
Not to use the content and/or information featured on this website to send advertising or messages for sales purposes or for any other commercial purpose, or to gather, store and process personal data. To refrain from suppressing any signs specifying the intellectual, industrial or any other property rights of Rodamientos IRB Bilbao S.L., or of a third party, that are posted on the website and in each one of the services provided through it. To refrain from circumventing or manipulating any technical device deployed on its website for the protection of its rights by Rodamientos IRB Bilbao S.L., or by third parties, involving the services provided or any other components, materials or information available on it. Not to use or apply resources of a technical, logical or technological nature to benefit directly or indirectly, for profit or otherwise, from the unauthorised use of the website’s services or content. Not to post, store or disseminate via the website or through any one of the services it contains, any software program, virus, or code, and, in general, not to proceed in any way that may damage, disable, overload or compromise the website, equipment, systems, networks, programs, data or information ofRodamientos IRB Bilbao S.L., or of its suppliers, users and, in general, of any third party, or impede the normal use and enjoyment of the website or the services linked to it. To accept any liability for the losses and damages that may be incurred by Rodamientos IRB Bilbao S.L., its employees, customers, suppliers, users, or third parties in general, due to a breach of these general terms and conditions or those of a specific nature of application to the services provided on the website, undertaking to exemptRodamientos IRB Bilbao S.L., its employees, customers and suppliers from any complaint, claim or penalty that may be pursued or imposed as a direct or indirect consequence of the aforementioned breach. When proceeding to register on the website, users undertake to provide truthful and accurate data and keep them updated. Not to use, disclose, distribute or use the information included in a service in any way that constitutes unfair competition for Rodamientos IRB Bilbao S.L. Rodamientos IRB Bilbao S.L. reserves the right to proceed without any prior notice to make those modifications to its website that it deems convenient. Rodamientos IRB Bilbao S.L. reserves the right to refuse or withdraw the right to access its website regarding any user that is in breach of its terms and conditions of use, as specified in this Legal Disclaimer, exercising, as appropriate, those civil and criminal proceedings to which it may be entitled. Rodamientos IRB Bilbao S.L. accepts no liability whatsoever for any losses and damages of any kind that may be caused by errors and/or omissions in content, availability, the transmission of viruses, malware etc. that might arise, even though it has adopted the measures deemed necessary and appropriate for avoiding circumstances of this nature. All attempts are to be made to resolve any dispute or claim on a prior and amicable basis between the parties. In the event an agreement cannot be reached, the parties agree to submit to the judgement of the Courts and Tribunals in Bilbao (Spain).